Take A Glass Blowing Class! A few of the classes we offer are listed below. Check the calendar for current classes. Join our mailing list for class news and special offers. NO experience necessary, minimum age for most hot glass classes is 9 years. All tools, materials and supplies are included, unless otherwise noted. No prior glass blowing experience required. All Classes are available for private groups. Remember to wear closed toe shoes and loose fitting cotton or natural fiber clothing, NO short shorts or short skirts. Bring water to stay hydrated, sunglasses and sunscreen if you have sensitive skin. Hands on classes for small groups, experience the basics of hot glass art techniques. 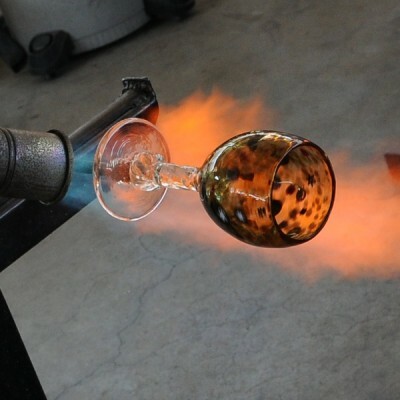 In this approximately 4 hour class you will learn the safety basics of glass blowing, see a demonstration and each student/artist will sit at the bench and work with our team to create their unique tumbler/drinking glass. You have taken the introductory class and made your tumbler, now take the next step and try a more advanced techique. In this class you will work with our team to create a wavy plate, bowl or vase. Introduction to Hot Glass is a prerequisite. In this small group class you will work with our glass blowing team to create a pair of shot glasses. No prior glass blowing experience required. Art and Romance. One hour of private instruction/glass blowing for two. Enjoy the Dance of creating together. 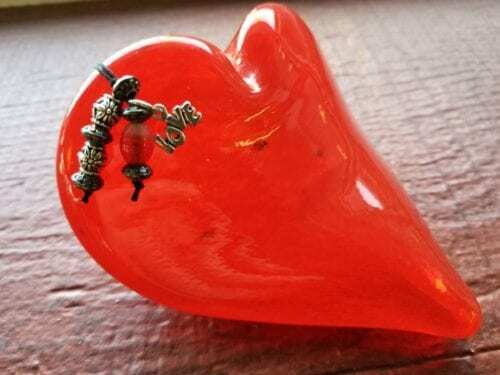 Guided by our glass blowing team you and your sweetheart will design and create your own personal work(s) of art. You may choose to make one or more blown or hot sculpted pieces during your session. Package includes a seasonal special gift. Choose from basic shapes and colors to design and blow your own pendant lights. All tools and materials are included to blow the pendant lights. Wiring is not included, can be purchased for an additional fee. Introduction to glass blowing or Glass Blowing Basics is a pre requisite – the more experience you have the better the result. Keep in mind glass is beautiful however not perfect; your lights will be unique. Variation in size, color, finish and shape are all a normal part of the process particularly for beginners. Join a small group class to experience the excitement of working with our team of glass artists to create your own Heirloom glass pumpkin. Start a new tradition; create your own holiday memory in glass.